Sail Grenadines is located on the picturesque island of Bequia in St. Vincent and The Grenadines. The normal sailing area covers the waters of Martinique, St. Lucia, St. Vincent and the Grenadines, and Grenada. A) Caribbean Airlines from the USA to St Vincent (via Trinidad usually) or B) If flying from Canada use the direct flight from Toronto to St Vincent . More routes will be on their way as our international airport expands! Ask us to deliver you your yacht to Grenada, Martinique, St Lucia or further afield! 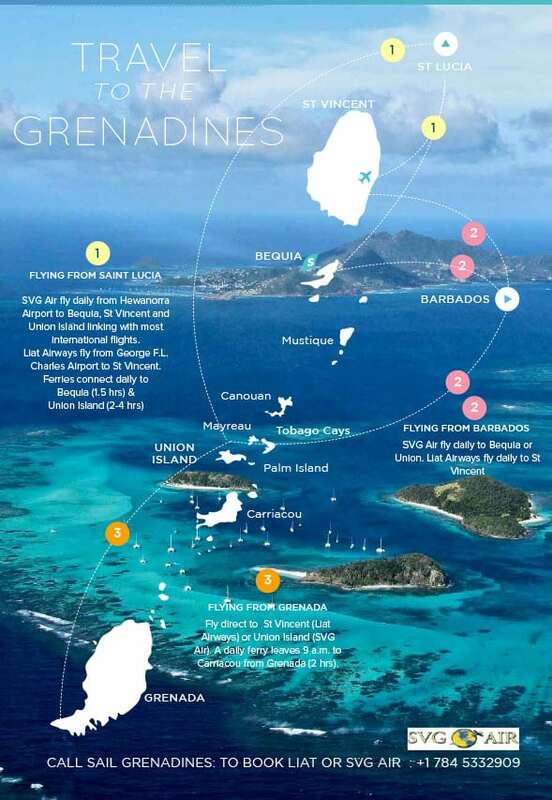 SAIL GRENADINES ARE AGENTS FOR ALL LOCAL FLIGHTS AND MOST ONSHORE ACCOMMODATION. Flights to Barbados and St Lucia from the UK with Virgin and BA. Ask us! Flights from USA and Canada – American Airlines, Delta, Air Canada and others. Ask us! Download our Route Planning Guide below to help with traveling to the Caribbean, between isalnds, as well as taxi and ferry information.